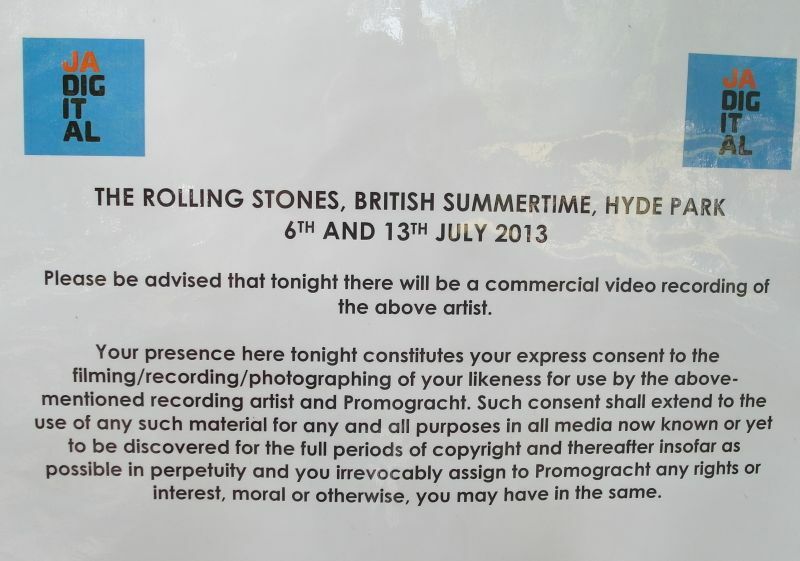 This thread is for live updates and comments regarding the Rolling Stones Hyde Park show #2 Saturday July 13. Please tell us your pre- and post-show thoughts and comments here. Edited 1 time(s). Last edit at 2013-07-13 11:12 by bv. Ladies and Gentlemen..THE ROLLING STONES! Edited 1 time(s). Last edit at 2013-07-13 09:30 by colonial. I bet this show will be the show of shows.... A BLOW OUT!!! Congrats to everyone who will be there, have a great time, but I know you will. Have a great time everybody! Here's to an absolute cracker tonight. Edited 1 time(s). Last edit at 2013-07-13 09:40 by MidnightRambler. Wow, yeah, it's "tonight" there already! Oh how I envy you all . . .
Last night of the tour. Complete new set, starting with Have You Seen Your Mother Baby, Standing In The Shadow and including Jigsaw Puzzle, Coming Down Again, 100 Years Ago, Hand Of Fate, Moonlight Mile, with Soul Survivor and We Love You as the final encores. Just landed in Heathrow, off to catch the Heathrow Express and...just mihttp://bit.ly/136oQ3nssed the 8:12 so it will be the 8.25 now, oh well! Flew over HP on the way in, will be more crowded tonight ! Edited 2 time(s). Last edit at 2013-07-13 10:19 by gotdablouse. Does anyone know if they are allowing larger cameras in? At 9am queueing for a show 12 hours later. I'm just 33, but I can't see myself doing that anymore. Especially in this heat we're getting. 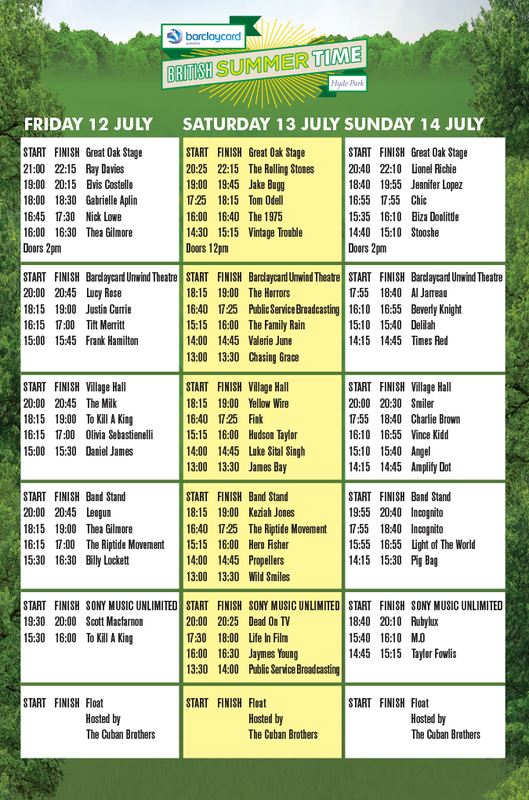 + I wanna see Valerie June at 2pm in the unwind theatre. Hotter than knebworth 76 me thinks. Glad i at home preparing the bbq! Yep. And that was a hot one. Edited 1 time(s). Last edit at 2013-07-13 14:01 by SonicDreamer. Yes, got the friggin' T3 angle barrier !!! It looks like Bill's been cut out of that Hyde Park '69 t-shirt. 3rd picture down, 2nd t-shirt in. Unless he's at the end of the line up and someone's just folded it very nicely. It maybe the last gig, we don't know. But this seems like a cattle fair, not a gig. If you can stand that, and actually enjoy it, good for you. Take care of the heat and you feel dizzy, don't be ashamed to go to some place where there is less stess and you can breath. And I still don't understand how you protect your spot in front of the stage if you go to the loo. Rockin' it out in T3 ! Have a fantastic time everybody! Let's hope the Glimmers can honor MT's contribution by letting him play the whole show. They certainly got rich off work where he was a major contributor so this is one way they can give back. Have a great show everyone, really wish I was there, although it's going to be a tough one in this heat...Glastonbury was hard enough but it must be pushing the 80's today (we Brits aren't used to these sort of temperatures!) I'm sure the lads will put on something really special tonight. Keep yer heads covered and drink water until later on. I've made the mistake of drinking alcohol at festivals in hot weather and it hits you hard later and you don;t wanna spoil your show. Jeez, I'm getting old! If you can't get to the show and are in europe with a HD stb move your dish to 24.5W and tune to 11580H 7500. The show is currently live. Have set timer and am off to get the train up there now. Hope to watch a rerun later if they don't switch off or encrypt the feed at 20.25!! Cheers folks! Edited 1 time(s). Last edit at 2013-07-13 17:40 by CaptainGlassback. Please upload it somewhere if your recording worked. re Vintage Trouble....saw them last month "supporting" The Who.....excellent band. That was by first Stones concert! God, we waited a long time for them to play, they were really @#$%& up and arrived very late by helicopter. It may have been hot but it was also very muddy! !